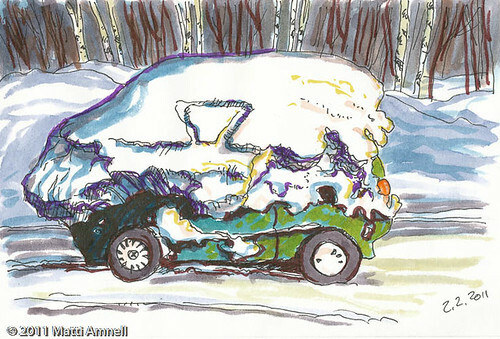 Snow-capped mystery car, originally uploaded by Brin d’Acier. The mystery about this car is not its model or why would somebody let this much snow accumulate on their vehicle. What’s mysterious is that it seems to have been driving around without disturbing the snow bank on top of it. The street under it has been cleared of snow and it has even left fresh tire tracks. This entry was posted in Sketch of the day, Sketchbook and tagged finland, helsinki, ink, watercolour. Bookmark the permalink. LOL! hilarious. it’s like a vanilla car sundae.